Sawn Timber, Structural & Finishing Timbers, Joinery Manufacturing, Timber Lighting Columns & Street Furniture, Specialist Commissions. Sawn Timber. NorBuild sell Fresh Sawn, Air Dried and Kiln Dried Scottish Hardwoods. Available species include Ash, Beech, Elm, Oak and Sycamore as well as - from time to time - small quantities of other native species such as Birch and Cherry. Douglas Fir and European Larch Softwoods also supplied. 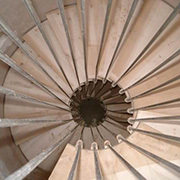 NorBuild will saw, dry and machine timber to your specification and arrange delivery throughout the UK. Structural & Finishing Timbers . NorBuild can supply you with timber for whole build project, from carcassing through to finishing timbers and internal fixtures and fittings. We build Post & Beam Frames, can manufacture Glu-lam Beams to your specification and can undertake commissions for sectional building of bespoke plans. Flooring. Character grade Elm, Ash, Sycamore, Beech and Oak, Tongue & Grooved, End-Matched, supplied in random lengths at a moisture content of between 10-12%. Unless otherwise specified, our flooring is manufactured and supplied to a standard face width of 137mm for Oak, 90mm for other species x 20mm thick. Examples of our Flooring include the Scottish Oak Floor at the Visitors' Centre in Glencoe, the Sycamore Floor at Natural Power's Renewable Energy Office in Dalry and the Elm Floor at the David Douglas Pavillion in Pitlochry. Cladding & Decking. We manufacture horizontal and vertical Cladding boards in European Larch and Douglas Fir, available off the saw or kiln-dried and profiled. Decking boards are 150mm wide x 32mm thick, kiln dried and machined, with anti-slip grooves. Decking is made from the heartwood of European Larch, the most durable softwood grown commercially in Scotland which is suitable for exterior use without treatment, although care should be taken with timber coming into direct contact with the ground. Birch Counter TopJoinery Manufacturing. As well as the sawmill, NorBuild run a Joinery Manufacturing shop, where they make Doors, Non-Standard Windows, Bespoke Kitchens, Worktops, Staircases and other specialist commissions in solid wood. Timber Lighting Columns. Commissioned by Highland Council Lighting Department for the Aviemore Re-Development Project, the Columns are a new product made from locally sourced European Larch. They provide an attractive, natural presence for an urban setting and are ideal for rural or sensitive locations where a low environmental impact is required. They are currently available in three sizes - 7.2m, 9.1m and 11.5m. We provide a friendly, personal service and our in-house expertise brings together many years' experience of working with Hardwood and Timber Products both in the Highlands and Scandinavia.